Bold Street Coffee celebrates its fifth birthday in May, Getintothis’ Peter Guy reflects on a Liverpool independent institution as Chris Burgess serves up a caffeine-assisted top 10 tracks. You can pretty much tell whether you like the feel of a place within the first few moments of entering. Whether it’s sights, sounds, smells or simply just the air – it’s funny how instinct takes over and you either feel settled or slightly unsteady. Now, we’re not entirely certain of the first time we set foot inside that heavy glass door that leads the way into Bold Street Coffee but we certainly felt quite at home. Perhaps it was the arabica aroma or the ambience provided by resident harpist Stan Ambrose, or perhaps it was the intriguing artwork that lined the white walls in an irregular, seemingly haphazard manner; or maybe it was the vintage funk mix pumping from the record player at the back of the shop. We’re not sure. It could have been the doorstop chocolate tiffin or moist carrot cake with a thick lick of icing or even the simple pleasure of a moment’s quiet while soaking up the choice stock of independent magazines and a delectably brewed flat white. 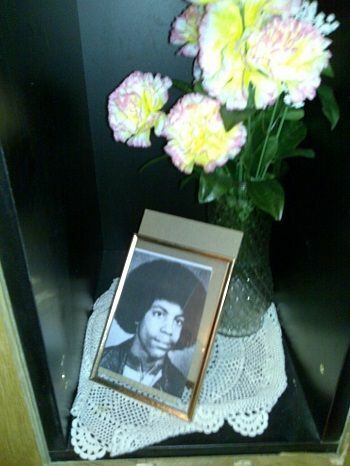 Or perhaps, more likely, it was discovering the old school portrait of Prince in a tatty frame tucked away in an alcove near the toilet. That’s probably more likely. Whatever it was, for us, like so many within Liverpool – we found a special new place in the summer of 2010 which would soon become one of the go-to places to hang out, meet friends, hatch plans, listen to new sounds or simply take time out. 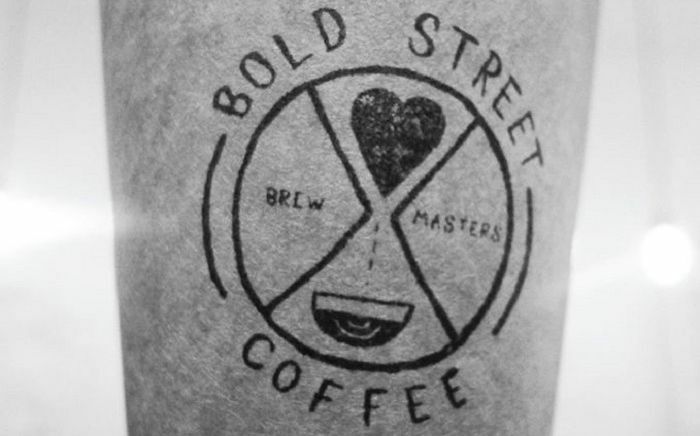 Of course, the ingredients which make Bold Street Coffee work so well far surpass their fair-trade, responsibly-sourced produce. Boss barista (and cycling Don) Sam Tawill has as keen an ear for high-end beats as he does for carefully selected beans; techno, funk, classic rock & roll and a serious predilection for Prince always goes down a treat when sat off on a dreary Tuesday afternoon. While various members of staff have moon-lighted in a number of the city’s underground music scene – most notably skateboarding BSC lifer and Salem Rages frontman Russ Longmire. This combination of contemporary sit off snug and choice ear candy has proved an irresistible force for Bold Street Coffee with the shop doubling up as a gig space on dozens of occasions during its five years with the likes of Alpha Male Tea Party, Exes, Nadine Carina, The Hummingbirds, Emperor X and almost-resident Serious Sam Barratt wafting their musical magic with intimate shows. Sound City, quickly spotted its charm too, adopting the shop as an official venue for three years, hosting the likes of Dan Croll, Revere, Stealing Sheep and a particularly impressive Spring Offensive who produced quite a clatter stomping their wooden heels on the boards during one late night session. And it’s not just live performances, musicians seemingly gravitate towards BSC – the Cassis Clay-like image of Willis Earl Beal sat off on the shop’s wooden bench, watching the world waltz by during a frenetic Sound City 2012, will forever raise a smile. 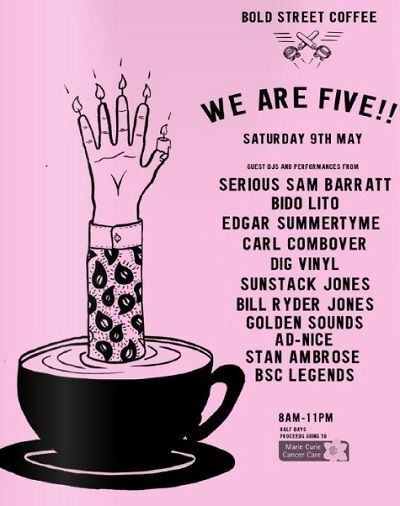 And there’ll be more memories to come, starting on Saturday May 9, as Bold Street Coffee hold their fifth birthday celebrations featuring among others, Edgar Summertyme, Sunstack Jones, Bill Ryder-Jones and a variety of DJs (full line up on the poster below). In the meantime, here’s a steamy top 10 caffeinated frothing classics. The krautrock maestros supply some surreal and nonsensical lyrics on this track from the seminal Tago Mago. “Bring me coffee or tea/Call me ‘pretty little bee’”, singer Damo Suzuki wails atop a minimalist freakout backing. Possibly more suited to an Amsterdam coffee house, Bring Me Coffee or Tea closes the 1971 album, and sounds as refreshingly contemporary as it did over 40 years ago. A fabulously heartfelt song from Lady Ella, pining for her man. “Love’s a hand me down brew” she sings – lost and lonely – relying on caffeine and nicotine to pass the time. Black Coffee showcases Fitzgerald’s sublimely smooth jazz vocals, her perfect intonation tugging on the heartstrings. Why anyone would want to leave that voice behind is beyond me. Cigarettes and Coffee is Otis at his most saccharine, sitting up in the early hours of the morning telling his acquaintance how much he loves her. On this grinding and uncompromising track from their 1992 album, Faith No More showcase the full range of the band’s musicianship. Mike Patton’s lyrics are chilling and their rhythm section tight and aggressive as Jim Martin’s guitar lines float above. Ok, despite the title it doesn’t have much to actually do with coffee, but it’s still brilliant. Coffee Mug is a triple espresso shot of a punk track, as Descendents’ frontman Milo Auckerman states the case for caffeine in an aggressive half-minute. “I don’t need no booze and drugs, I just chug-a-lug my coffee mug” he shouts over a wall of distorted guitar. And it sounds like he means it. Taken from 1975’s Desire, One More Cup of Coffee tells the story of a girl from a family of drifters, and her man who must leave her side, sung as a duet with Emmylou Harris. Dylan’s delivery gives the song a Middle Eastern tang, as the Romany violin rises and falls beneath. All samba-swing cool, Frank gives us a rundown on the coffee trade in Brazil. Turns out they’ve got an awful lot of the stuff down there. 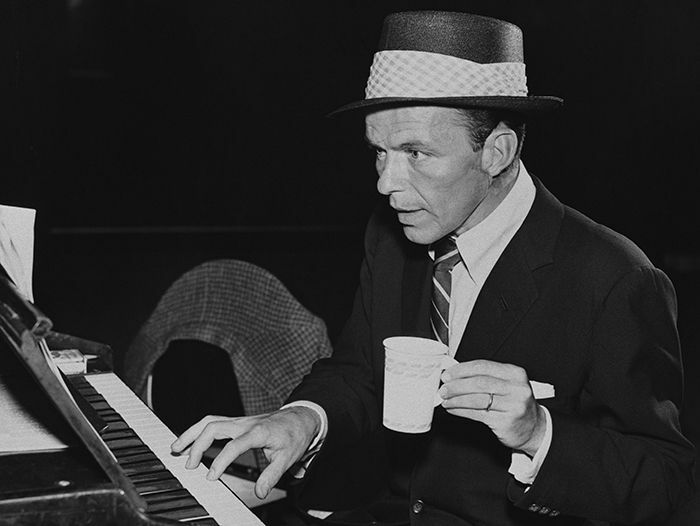 Yes, it’s a novelty song, but Sinatra is on top form – his singing magnificent as the underlying arrangement from Johnny Mandel snaps and pops along. The American duo of singer Amelia Meath and producer Nick Sanborn provide an instant pick-me-up with Coffee, a sophisticated and laid back electronic tune. Sanborn’s xylophone tones and smart beats are rich yet sparse, sparkling as Meath’s wispy vocals seem to dissolve away like a sugarcube. Canadian composer MacDermot, most famous for writing the hippy musical Hair, here provides a warm frothy jazz tune. 1966’s Coffee Cold percolates away as MacDermot’s bright piano bubbles over a strong backbeat and gorgeously rich and deep bassline. It perfectly captures coffee shop atmosphere, rising and falling as it goes along. 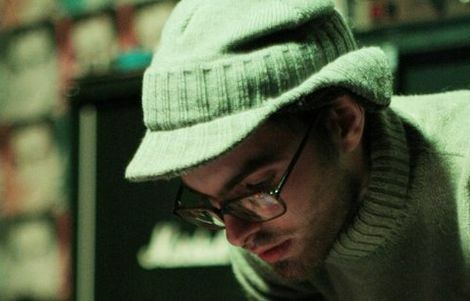 Famously used in the film The Thomas Crown Affair, the track has been heard most recently in Better Call Saul, and has been sampled by many hip hop artists. A song that took ten years to become a hit, Tom’s Diner was written by Vega in 1981 but became a global smash a decade later after producers DNA laid the a cappella vocal over a Soul II Soul sample, taking Vega’s improvised outro and making it the main hook. Vega’s label decided to buy and release the track, rather than sue for copyright, and brought the American artist one of her biggest hits – not bad for a short song set in a café. The song has been covered and sampled by such diverse artists as REM, Lil’ Kim, Drake, Fall Out Boy and, most recently, Giorgio Moroder and Britney Spears.